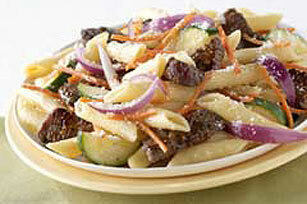 Garden veggies put some color into this flavorful Steak & Pasta Toss. It's one of the quickest ways we know of to feed a table of eight! Meanwhile, sprinkle steak with dressing mix; toss to coat. Heat 1 Tbsp. of the oil in large nonstick skillet. Add steak; cook and stir 3 min. or until cooked through. Remove from heat. Set aside until ready to use. Drain pasta; place in large bowl. Add steak and all remaining ingredients; mix lightly. To help boost the flavor and color of the zucchini, add it to the cooking water for the last few min. of the pasta cooking time.